Good morning ... Let's get to the news. At separate developer conferences this week, both Microsoft and Google are expected to promote their efforts at artificial intelligence — and each will claim not only to do AI well but to do it "right," as in ethically and to the benefit of society. 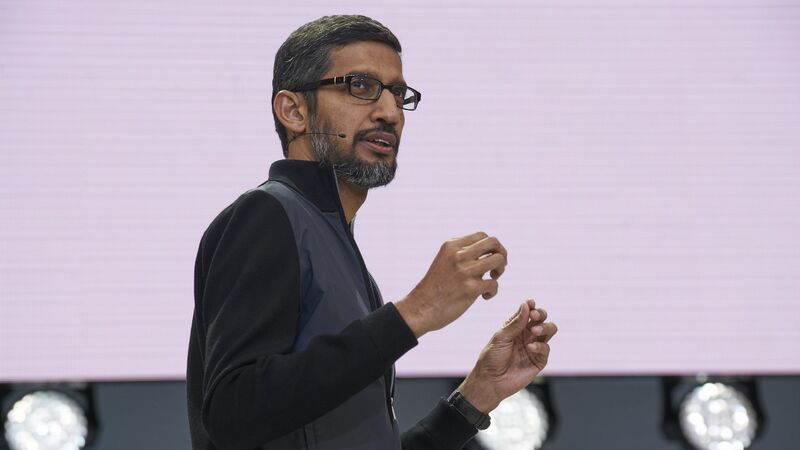 Google's I/O conference runs Tuesday to Thursday in Mountain View, Calif. CEO Sundar Pichai is expected to focus a lot on AI and how it's influencing its own products and creating opportunities for developers. Microsoft's Build conference starts today in Seattle and runs through Wednesday. In addition to keynote speeches, there are more than 2 dozen sessions on AI, including a look at how Microsoft uses AI internally and an update on Microsoft's AI for Earth program. Microsoft committed $50 million over 5 years to its AI for Earth. Why it matters: There is a lot of potential for AI to make us healthier and more productive, but also lots of fears, which include everything from killing jobs to the machines taking over. What to expect: For Google, there will likely be lots of news around Android P, Google's efforts in augmented reality and virtual reality as well as its Home and Maps efforts. Microsoft, meanwhile, has been getting much of its growth from its cloud-based Azure efforts rather than Windows, so it'll be interesting to see how much attention each gets at Build. Four out of 5 Facebook users say they wouldn't pay $1 a month to banish ads on the social network, according to a recent survey by market research firm Alpha. Why it matters: Facebook is reportedly test-marketing a paid, ad-free version of its service. Despite the recent onslaught of news about the Cambridge Analytica scandal, congressional testimony by CEO Mark Zuckerberg, and the #deletefacebook movement, the company's vast user base may not be discontented enough to force a business-model change. Pay or leave? In other survey results, Facebook users overwhelming said that they'd leave the service if the company began to charge $1 per month for certain key features like private messaging, seeing/registering for events, and seeing/registering for groups. One-on-one messaging: 84% would probably leave Facebook, 16% would pay. Events: 87% would probably leave Facebook, 13% would pay. Groups: 84% would probably leave Facebook, 16% would pay. Go deeper: Kia Kokalitcheva has more here. There are likely many factors that led to the recent peace talks between the leaders of North and South Korea, but a USB drive played no small part. Buzz: According to my Axios colleague Jonathan Swan, the USB drive was given by South Korean President Moon Jae-in to North Korean leader Kim Jong-un and contained Moon's plan for how peace could benefit North Korea's economy to the tune of tens of billions of dollars. Read more: Jonathan's full story is here. The number of corporate mergers has jumped in recent years, but funding has stagnated for the federal agencies that are supposed to make sure the deals won’t harm consumers, reports Axios' David McCabe. Why it matters: A wave of megamergers touching many facets of daily life — from T-Mobile’s merger with Sprint to CVS’ purchase of Aetna — will test the Justice Department's and Federal Trade Commission’s ability to examine smaller or more novel cases, antitrust experts say. “You have finite resources in terms of people power, so if you are spending all of your time litigating big mergers … there might be some investigations where decisions might have to be made about which investigations you can pursue,” said Caroline Holland, who was a senior staffer in DOJ’s antitrust division under former President Obama and is now a Mozilla fellow. Microsoft's Build conference starts in Seattle (see above). Daniel Jones, a general partner at Global Venture Capital (Rocket Internet's venture capital arm) is leaving the firm, according to TechCrunch. It's not just you. The rise in robocalls is off the hook, according to new data from YouMail per the New York Times. The Guardian has more details from whistleblower Christopher Wylie on how Cambridge Analytica used millions of people's Facebook data to profile voters. Cheddar, aka the "CNBC for millennials," is launching its own business-focused news channel for Snapchat Discover. While there are a lot of things to be excited about with AR, there are some pitfalls that need attention now, Founders Fund partner Cyan Banister and Xperiel co-founder Alex Hertel write in TechCrunch. The Independent reports that a NASA advisory group says SpaceX fueling rocket technology may pose a "potential safety risk" for planned human flights. Today's entry comes from Login reader Mike Malloy, who in addition to his day job as a program manager at the Halcyon Incubator in D.C., is the coach of Georgetown's Ultimate Frisbee team. The team recently knocked off UNC-Wilmington in an amazing play to advance to its first-ever trip to nationals. It's what's known in the sport as a "greatest" meaning a player jumped from in bounds and flipped the disc back in play before landing out of bounds. It then gets tipped before landing in the hands of a teammate for the win.